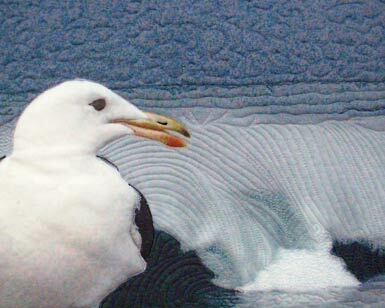 Calm Before the Storm art quilt by Barbara Barrick McKie. A seagull awaits the coming storm as waves pound the shore. 36 1/4" w. x 28" h.
Just before Christmas, 2002, we visited the pier at Hermosa Beach just before a huge storm. 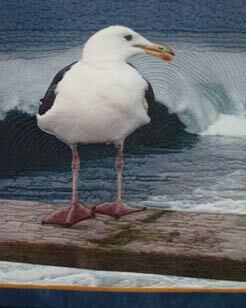 A seagull posed dramatically on the pier as the waves pounded in. 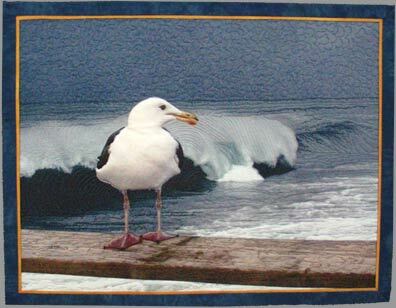 Hand dyed cotton borders, disperse dyed polyester, trapunto treatment to the seagull, extensively free- motion machine quilted.